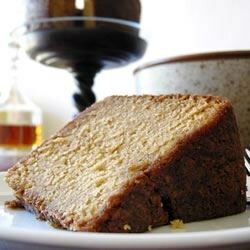 "Serve this rich and decadent cake up for your next Fat Tuesday/Mardi Gras feast." Preheat oven to 350 degrees F (175 degrees C). Lightly grease a tube pan. Sift flour, baking powder, and nutmeg together in large bowl. In a small bowl, mix 3/4 cup bourbon, the milk and vanilla. In a large bowl, beat the butter until smooth and creamy with an electric mixer. Beat in brown sugar until the mixture is fluffy. Add the eggs to the mixture, beating one in at a time. Mix the flour mixture and the bourbon mixture into the large bowl, small amounts at a time. Using a wooden spoon, stir the pecan pieces into the batter. Transfer the batter to the prepared angel food cake pan. Arrange the pecan halves in circles on top of cake (they will be on the bottom once the cake comes out of the pan). Cover the pan with foil. Bake in preheated oven until a tester comes out clean, about 1 hour 40 minutes. Remove foil and bake another 20 minutes. Let the cake cool 20 minutes before removing it from the pan. Pierce the cake with a fork or knife in a few places and pour 1 cup bourbon over the cake. A moist, tender coffee cake with a sweet, crunchy pecan topping. This cake really needs a chance to mellow...at least overnight. It gets better with age, especially with extra splashes of bourbon every so often. I will probably try this cake sometime but oooohhweeee..did you get a look at the calories and fat grams on the cake?!!! Yuuum--was a total hit last Fat Tuesday. Everyone loved it! Was worth the time it took to prep all the ingredients! I made this cake before the Holidays and was very disappointed. A fairly expensive cake to make and did not have much flavor to it at all. I made this for some men who I use to work for and they LOVED It. Can you guess why?? Sounded great, but we didn't like it at all. Too much nuts, the mix of flavors just didn't hit it off with our family.